LOUISVILLE, Ky.— Oct. 2, 2015—The Kentucky Association of Manufacturers (KAM) announced the winners of its 15th annual Manufacturer & Employee of the Year Awards at their Awards Luncheon this afternoon at the Seelbach Hilton in Louisville. Innovation, Teamwork, Community Service and Leadership. 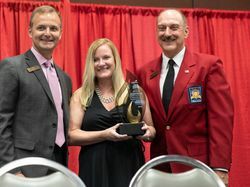 With the impressive list of Danette Wilder’s accomplishments, the exceptional reputation and success of SealingLife, Inc. comes as no surprise. When SealingLife first opened its doors in 2008, founder and President Danette Wilder eagerly faced the many challenges of being a woman-owned rubber product manufacturing company in a predominantly male industry. She pursued the AS9100 international aerospace quality certification, an unheard-of accomplishment for smaller companies the size of SealingLife. Ask any employee of SealingLife and they will tell you that Danette epitomizes what it means to work as a team. Continually emphasizing that “there is no ‘I’ in teamwork,” she is passionate about always working for the benefit of her SealingLife team. Although she is President and CEO of the company, if there is not a scheduled meeting or other business matter demanding her time, you will find Danette on the production floor with every other SealingLife employee. Even with the demands of her busy schedule, Danette prioritizes time to serve her local community. As an educational speaker and volunteer for several local non-profit organizations, Danette was recently appointed to Kentucky's Workforce Innovation Board, and is Vice-President for the Bluegrass chapter for the Kentucky Federation for Advanced Manufacturing Education (KY FAME) along with serving on many other community boards. Danette Wilder lives by the principle of “leading by example.” She is driven by her sincere desire to help others succeed. 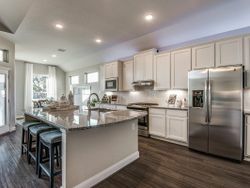 Danette’s distinguished character, both professionally and personally, contributes to her recognition as an influential leader in all of her many accomplishments. Congratulations to Danette Wilder, winner of the 2015 Manufacturing Employee of the Year Award. For over 50 years in Bowling Green, KY, Holley Performance Products has been an industry leader in high performance exhaust products, standalone EFI systems, carburetors, intake manifolds, superchargers, water pumps, plumbing components and fuel pumps for street and race applications. With a central concentration on the high-performance aftermarket, where its world-famous carburetors have won more races than all others combined, Holley products have powered every NASCAR team since the 1960s. 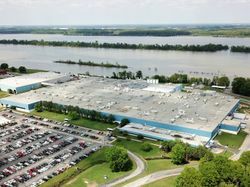 In 2014, Holley announced their creation of a state-of-the-art research and development work cell facility for designing industry-leading exhaust systems at their Bowling Green headquarters. The revolutionary facility brought an investment of $1,325,000 to South Central Kentucky and generated 20 new jobs. Holley Performance Products is a valued member of their local community of South Central Kentucky, with key leaders serving on the Bowling Green Area Chamber of Commerce Motorsports Steering Committee as well as working to develop a strategic plan to grow the local economy through the community’s rich motorsports heritage. Additionally, every year Holley brings the Holley National Hot Rod Reunion to Beech Bend Raceway, a three-day event hosting about 20,000 visitors and pumping an estimated $4 million into the Bowling Green economy. Holley Performance Products recently announced partnership with On Track, a Motorsports Education initiative that integrates critical STEM concepts beneficial to the development of talent for the future workforce of South Central Kentucky. Holley is also a long-time member of Specialty Equipment Market Association (SEMA), the Performance Warehouse Association, and active participants with NASCAR, NHRA, ARCA and other racing organizations that assist in the advancement of business and innovation in South Central Kentucky. As the industry standard in both the development and manufacturing of high-performance automotive products through their dedication to innovation and responsibility to corporate citizenship and advocacy, we congratulate Holley Performance Products on winning the 2015 Manufacturer of the Year Award in the mid-sized company category. GM of Supply Chain Mike Chanatry and other employees accept the Manufacturer of the Year award on behalf of all GE Appliances employees. 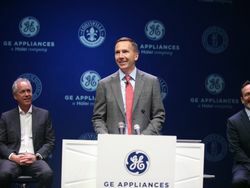 GE Appliances, a world-class manufacturing company with industry-leading products, has invested more than $1 billion since 2010 to revitalize and reshore its U.S. facilities, processes and products, with the majority of that funding going to Appliance Park in Louisville, Kentucky. In the process, GE has revitalized a 60+ year old manufacturing facility, added over 3,000 new jobs, developed a new collaborative product development process, and worked to build a new culture that affords employees at all levels the opportunity for full engagement. Additionally, GE has created a product design process open to designers from every region of the world, all while challenging their competitors with world-class products with first-to-market features and leading-edge technology. As an additional benefit to their ongoing reshoring process, hundreds of new service and part manufacturing jobs were created in Kentucky, Indiana and other surrounding states to meet the demands of GE’s growth strategy. For more than 60 years, GE Appliances and its employees have been known for giving back to the community through volunteerism, expertise sharing, and product and monetary donations. With a focus primarily in the areas of Education/Workforce Development, GE drove collaboration among area manufacturers to create the Blueprint for Bridging the Industrial Skills Gap: An Urgent Call to Action from Greater Louisville Manufacturers, which resulted in the establishment of the Greater Louisville Chapter of KY FAME and the first Advanced Manufacturing Technician class enrolled at Jefferson Community & Technical College. GE Appliances’ commitment to the advancement of manufacturing and the industry is widespread; including CEO Chip Blankenship’s leadership of the National Association of Manufacturers’ national task force on Competitiveness & the Workforce in 2014, creating an action plan and toolkits for manufacturers across the country to use to help improve the manufacturing skills gap. For their dedication to continued innovation, responsibility to corporate citizenship, and advocacy of the manufacturing industry both locally and nationally, we are pleased to announce GE Appliances as the 2015 Manufacturer of the Year Award winner in the large company category. Congratulations to all of our 2015 Award Winners! 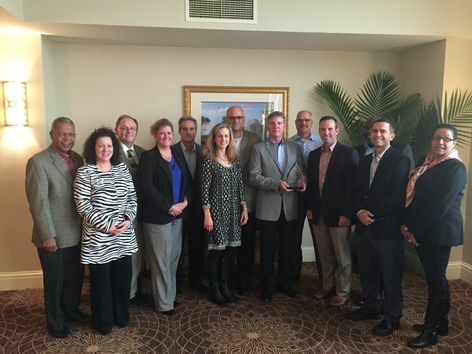 GE named Manufacturer of the Year by the Kentucky Association of Manufacturers.